At Advanced Hygienic Contracting, we supply and install the best products available to provide you with a cladding service you can be proud of. Find out more below about the advanced cladding products we use. As well as reduced manufacturing and installation costs, hygienic wall cladding has far fewer joints, so there is less area for water to penetrate and cause failure, unlike tiles. With better impact and stain resistance than traditional tiling, they also have low water vapour transmission, so there is no penetration of damaged surfaces or grout. Hygienic and Antimicrobial PVC cladding panels don’t flake or corrode like paint and steel will, and our system comes with a 20-year guarantee. Typical areas of application include food manufacturing, kitchens, pharmaceuticals, laboratories, showers and W.C.’s. We are proud to install cladding supplied from leading companies such as BioClad, Trovex and Altro. In areas exposed to high amounts of traffic, wall protection can be utilised to add an additional element of protection to preserve the environment. The range of that we install includes bump rails, corner guards, hands rails. Additionally, antimicrobial wall protection can also be installed using the BioClad BioArmis range. The textured finish on the surface is designed to prevent scratching and scuffing, and the increased impact resistance of helps to reduce the chances of dints and holes being created. Corridors where there are trolleys, wheelchairs, chairs, human traffic etc can damage at any point but there is a need to be hygienic. Corporate office corridors to provide a low maintenance, long lasting and attractive solution available in many colours and finishes, with matching hand rail, bump rail corner guards etc. Clinical labs and hospital walls where equipment such as hospital beds and heavy clinical machinery can be suspect to causing bumps and dents due to transportation. There are instances when certain areas require additional protection beyond what is provided by hygienic PVC wall cladding. Stainless steel is a great choice specifically for areas that are exposed to temperatures above 40 degrees Celsius such as hot areas found in commercial kitchens. In order to provide a tight, uniformed finish, the stainless steel sheets installed by us come with matching corner angles, joining trims and end caps. We are proud to install some of the leading safety floor solutions from leading brands such as BioClad, Gradus and Altro. 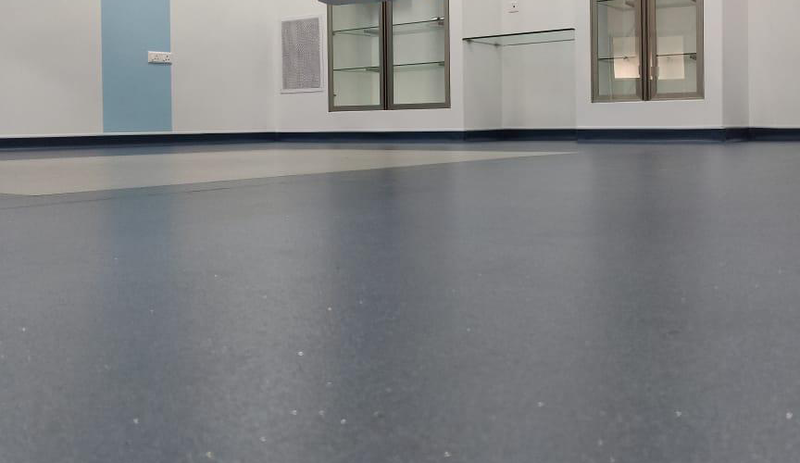 The safety flooring products we install have all been specifically designed to reduce the risk of slips, trips and falls whilst providing safe movement for areas exposed to high levels of footfall. We can install Antimicrobial hygienic door sets for healthcare, schools and manufacturing environments. Doors, frames and architraving are encapsulated in thermoformed BioClad PVC to give anti-microbial protection.